Looking for an easy-peasy dessert to serve this summer? Look no further…this one has four ingredients and is done right on the grill. I won’t say it’s impossible to mess up, but it’s pretty tough to do this one wrong! Two quick notes: Use a good quality balsamic vinegar — they’re typically thicker and sweeter than the cheap stuff. Don’t leave the berries on the grill too long or the sugar will cause them to burn. 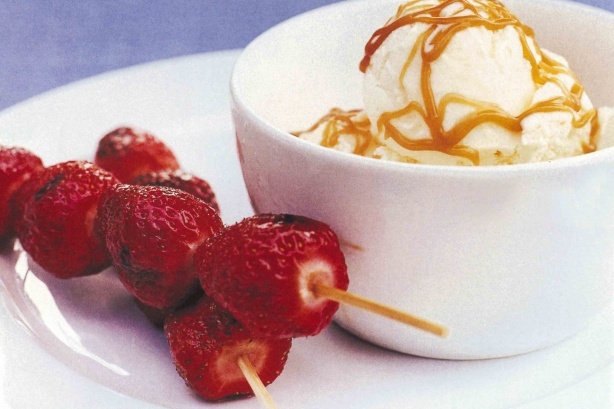 In a large mixing bowl, toss strawberries with just enough balsamic vinegar to coat. Let stand for 15 minutes so that some of the vinegar can be absorbed. Place the brown sugar in a shallow bowl or rimmed plate. Roll each berry such that each one has a thick coat of brown sugar. Preheat grill to medium heat. Grill each skewer for about 2 minutes on each side. Eat while still warm, served with vanilla ice cream.